Tsuyoshi Domoto (‘KinKi Kids’) cast in upcoming live-action film “Gintama” starring Shun Oguri. 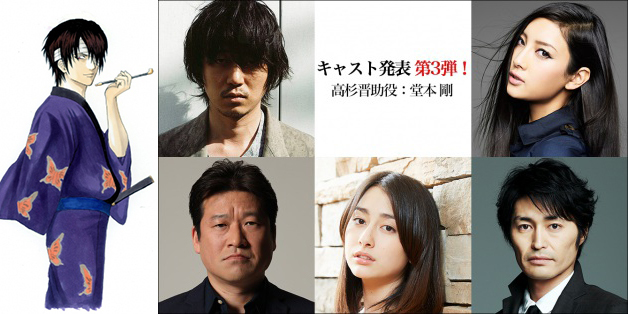 Also, newly announced supporting actors now include Hirofumi Arai, Jiro Sato, Nanao, Ken Yasuda & Akari Hayami. For Tsuyoshi Domoto, movie “Gintama” will mark his first movie acting role since 2005 film “Fantastipo.” In live-action film “Gintama,” Tsuyoshi Domoto will play Shinsuke Takasugi. His character is a master of kenjutsu and Gintoki Sakata’s (Shun Oguri) rival. He leads Kiheitai which is a radical armed group that aspires to expel foreigners. For the intense battle scenes between Gintoki Sakata (Shun Oguri) and the Kiheitai group, an action directing team from South Korea was invited on Shun Oguri’s suggestion. “Gintama” will be released sometime next year in Japan.